Free Wi-Fi cable TV and budget rates are some of the benefits at the non-smoking Morgantown Motel which is close to West Virginia University and a mall. 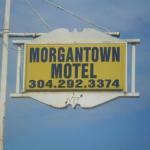 The single-story Morgantown Motel is a non-smoking property that houses 44 rooms with exterior entrances. The simple rooms provide free Wi-Fi and cable TV and some rooms are equipped with microwaves and mini-fridges. Convenient amenities include a guest laundry and alarm clocks. Outdoor parking is available. Off Highway 119 about 20 minutes south of the Pennsylvania State line the Morgantown Motel sits above the Monogahela River on a hillside with mountain views. Central Morgantown is two miles away and West Virginia University is less than three miles. Guests shop at the mall a half-mile away or check out the charming brick shops and restaurants downtown. Other attractions include Cheat Lake 10 minutes away and the West Virginia Botanic Garden 15 minutes from the motel. The closest major airport is Pittsburgh International Airport 82 miles north.